You are visiting the world's best Shelby webpage!! 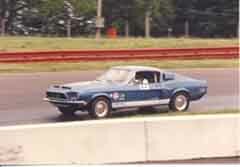 One of the first 1968 Shelbys I ever saw was an Acapulco Blue, GT500 fastback. I asked the owner, Craig Skala, to write a few words about his car. Here is Craig's story. The Shelby mystique was increasing every year since introduction, so no doubt by autumn of 1967, patient Ford dealers and customers around the country were very anxious to see a new 1968 Shelby Cobra GT350 or GT500 (yes that’s the correct name) on the showroom floor. But on September 6, 1967 the UAW called a company-wide strike, which continued 66 days until November 11, 1967 causing the drought of new Ford vehicles. The word of an impending contract settlement must have been going around, because on November 7, 1967 Northwestern Motors in Milwaukee, the only authorized Shelby representative in Wisconsin, sent an order to Shelby Automotive on behalf of Zweifel Ford, in nearby Wauwatosa WI. Side note: Zweifel later became Best Ford/Mazda, which is now Russ Darrow Ford. The order simply specified a GT500 with 4-speed manual transmission, blue paint, black interior, and standard wheel covers. No a/c, no tilt steering wheel. This order was quickly assembled and stamped as #44, then shipped by rail in the first week of January 1968. An original Shelby Automotive shipping ledger shows this car was the second 1968 Shelby sent to Wisconsin. An interesting note about Northwestern is that at some time during 1966 or 1967, they quickly learned to secure the hoods of all Shelbys on their lot. Did you know that Shelbys came with exotic finned aluminum valve covers & air cleaners and 4-barrel carburetors? Yes it’s true, and “non-buyers” knew it too. The dealership during those years could leave the cabled clevis pins hang, and install padlocks. However, past Northwestern employees confirmed that since the 1968 models debuted with the new twist hood latches, they customarily and immediately removed them to install aftermarket plate-style locks opened by a key. Since #44 still has the original twist latches, someone from Zweifel Ford was probably there waiting when the car was delivered to Northwestern, considering the long time they waited to get the newest model Shelby. In 1979, I purchased #44 not two months after graduating high school. Remember, then a muscle car was usually driven by some delinquent, and a 1968 Shelby was considered an eleven year old, worn out, technologically outmoded, gas guzzler. It sported the typical aftermarket mods of the seventies: air shocks, leaf spring shackle extensions, Thrush mufflers sans tailpipes (!! ), riding on deep dish aluminum slotted mags at the rear, and Unilug classic 5-spokes up front. The only way I could’ve been happier was to go buy another. You know what they say about hindsight. #44 has not been restored, just returned back to a more stock condition. I’ve left in the vintage Hurst shifter and lowered the A-arms one inch, making it a good performer for a few SAAC conventions, Northwoods and other Region events, and general fun.